French overnight trains . . . The Train Bleu Intercité de Nuit couchette train from Paris, arrived at Nice. Note the palm tree! It's the most time-effective way to travel. Sleep your way from Paris to Nice, Cannes, Antibes, Toulouse, Perpignan, Latour de Carol, or the Spanish border from just €35 (£33). 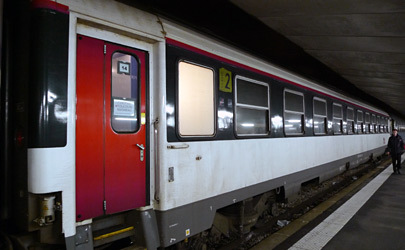 Formerly branded Lunéa, French overnight trains are now Intercités de Nuit. These will continue to be funded as socially necessary for the regions they serve. The Paris-Nice intercité de nuit (once the famous Train Bleu) was discontinued on 9 December 2017. 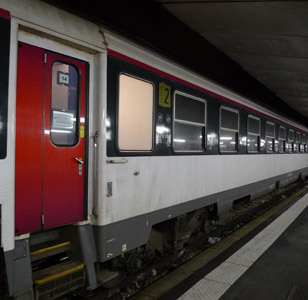 It can help to know that reservations for these trains regularly open late for booking, as SNCF are not good at maintaining the usual 90 day booking horizon for these trains. These trains have couchettes, simple flat padded bunks each supplied with a fresh clean pillow, individual reading light and special lightweight sleeping-bag - a great idea, replacing the traditional sheet & blanket. Each passenger gets a bottle of mineral water, earplugs (if you really need them) & tissues. French couchette cars have been modernised with quiet carpeted interiors & soft fabric bunks. Only bona fide passengers with tickets & reservations are allowed onto the platform, and there are minimal stops between 00:00 & 06:00 for a smooth, safe & secure journey through the night. 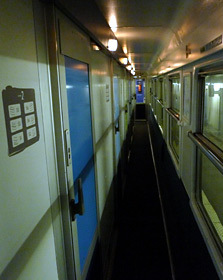 Sleeping-cars with 1 & 2 bed compartments were withdrawn from French domestic overnight trains in December 2007, but if you want privacy you can book a whole couchette compartment for exclusive private use, see the Espace Privatif section below. 1st class couchettes have 4 berths per compartment, upper and lower on each side of the compartment. They feel much more spacious than 2nd class couchettes, as there are only 4 people not 6 in a slightly larger compartment. Great for families or a group of friends. If you want sole or dual occupancy of a whole compartment, see espace privatif below. Couchette numbering plan. 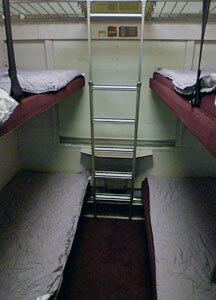 2nd class couchettes have 6 bunks in each compartment, upper, middle & lower on each side of the compartment. Obviously, if you have any mobility problems ask for a lower berth, but the cosy top bunks up in the roof space give you more privacy and are my personal preference. Having said that, although cars are air-conditioned with adjustable temperature control, bottom & middle bunks can be cooler than top bunks on a hot summer night. Couchette berth numbering plan. You can book a whole compartment for just 4 or 5 of you if you like, see espace privatif below. In both classes: Men & women are mixed in couchettes as you don't normally fully undress, but women travelling alone can book a berth in a ladies-only compartment if they like. 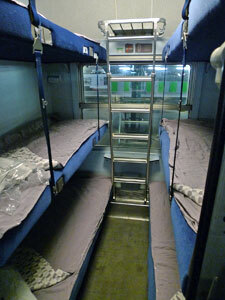 If you've children, you can ask the train staff for a child safety rail for their bunk. Compartment doors have a security lock which cannot be opened from outside even with a staff key, and staff are on duty if you need them. There are washrooms & toilets at the end of the corridor. If you want privacy, you can reserve a whole couchette compartment for your own exclusive private use. Naturally, if you booked 4 tickets in 1st class 4-berth or 6 tickets in 2nd class 6-berth you'd get a whole compartment automatically with no need to pay any extra fee, but 1, 2 or 3 people can reserve a whole 1st class 4-berth compartment and 4, 5 or 6 people can reserve a whole 2nd class 6-berth compartment simply by paying an Espace Privatif supplement. Note that you may or may not be offered this option on your chosen date & train. How much does Espace Privatif cost? If you're travelling solo, you pay whatever the cheapest 1st class couchette fare happens to be, plus a fixed supplement of €70 to get the whole 4-berth compartment to yourself. If there's 2 of you, you each pay the cheapest available 1st class couchette fare, plus one fixed supplement of €50 to get the whole compartment to yourselves. If there's 3 of you, you pay the 1st class couchette fare plus a €40 supplement. 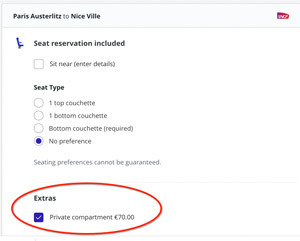 Similarly, 4 or 5 people can have private use of a 2nd class 6-berth couchette compartment by each paying whatever the cheapest 2nd class couchette fare happens to be, plus a fixed-price supplement of €45. How to book Espace Privatif online: Go to www.trainline.eu and run an enquiry, select a first class fare for the overnight train you want. Then select Private compartment, assuming if that option shows up. If that option doesn't appear, then Espace Privatif is unavailable on that date & train - although you can always just book all the berths in a compartment, of course. You print your own ticket or collect it at the station. The Espace Privatif arrangement can also be booked online at French Railways' own site en.oui.sncf, although it's much easier at to use www.trainline.eu. However, it cannot be booked online at Raileurope.com or Raileurope-world.com or Loco2.com. It can also be booked by phone direct with SNCF in France on 00 33 970 60 99 70, lines also open evenings and weekends. You take your luggage into the compartment with you. There's space for bags under the bottom bunks, on the rack above the window, and in the big recess over the compartment door projecting over the ceiling of the corridor. 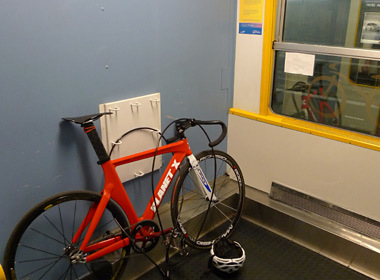 Bikes can be taken for a small charge, these travel in a voiture service in the centre of the train, which also houses the train manager's office. There's no cafe or bar car on board, so bring your own drinks & snacks (and perhaps a bottle of wine!) onto the train with you. Evening meal before leaving Paris? I'm not a fan of eateries at the Gare d'Austerlitz, but when heading south, why not catch an earlier Eurostar and have dinner at the famous Train Bleu restaurant at the Gare de Lyon? You can walk across the Seine from the Gare de Lyon to the neighbouring Gare d'Austerlitz after dinner in 5-10 minutes. 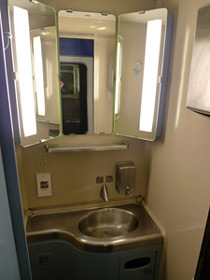 In 1st class 4-berth couchettes, only the lower and top berth numbers are used. 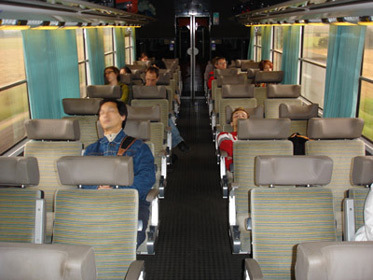 Most Intercités de Nuit overnight trains also have 2nd class reclining seats, and you'll also find overnight TGV trains on some routes with non-reclining seats. However, a couchette allows you to sleep properly lying down in a securely locked compartment, so is the recommended option and well worth the small extra cost. Travelling overnight in a seat is not recommended except in emergency. Buy tickets online at www.loco2.com (can be used by anyone, price in €, £ or $) or www.trainline.eu (can be used by anyone, prices in €). Booking usually opens 92 days ahead (or should do, but often less than this), fares vary so book as soon as you can for the cheapest rates. 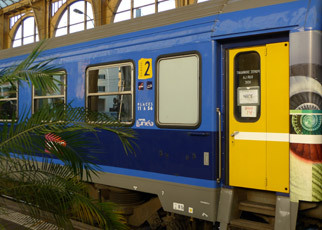 Cheap prems fares start at €35 (£33) one-way in a 2nd class couchette, €60 (£57) for travel in a 1st class couchette. Berths are sold individually. Tip: Select Obligatory lower couchettes if you have mobility problems so positively must have lower berths. Overseas visitors can also buy Intercité de Nuit tickets at at www.raileurope.com (US residents) or www.raileurope-world.com (residents of Australia, NZ, Canada, Asia, Africa & South America), but be warned, it's often cheaper to buy from www.loco2.com or www.trainline.eu as there's no added fee. 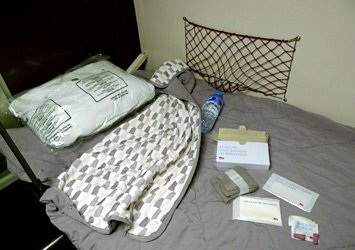 Each couchette has a lightweight sleeping-bag, mineral water & pack with tissue, wipe, ear plugs & (in 1st class) travel socks. 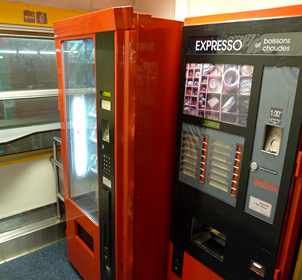 The vending machines in the voiture services may now be out of service. The voiture services (on some trains) has space for several bikes, a small charge is made, see the bikes by train page. Reclining seats on an Intercité de Nuit. Sitting up all night in a seat is a false economy - always book a couchette.